Purchase the 13" Sony Vaio Flip Digitizer + LCD part only for $269.95 and do the repair yourself! Check out our screen replacement tutorial! Alternatively, you can sent it to us and one of our experienced technicians will repair it for you! We have the parts in stock and our turn around for any repairs on these models is 1-2 business days as we have anything necessary to complete a prompt and efficient diagnostic. 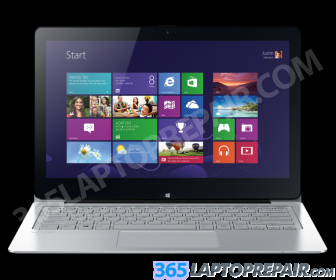 Are you ready to start you repair and get your Sony Vaio Flip fixed fast? Click the add to cart button below to begin the checkout process, we accept credit cards and PayPal. We offer many shipping options to and from our warehouse. You can pack your laptop and ship it to us yourself, or we can send you a pre-paid shipping label and a safe ship box to ship your laptop quickly, easily and safely! The replacement service that we provide for the Sony Vaio Flip SVF13N17PXS includes the cost of a brand new LCD screen and the labor to install it. This service also comes with a No Dead Pixel Guarantee and a 6-month warranty on parts and service. We use genuine new LCDs, not aftermarket or cloned products. This laptop has a LCD screen and Digitizer (Touch Screen) that is attached at the factory. In order to fix either the digitizer or the LCD screen, both have to be replaced. The replacement screen assembly does not come with a bezel, so the existing bezel is heated up and removed from the old screen assembly and put on the new one. This laptop comes stock with a 256GB Solid state drive (SDD). This laptop uses a unique type of SSD, If you are interested in replacing or upgrading the hard drive please contact us for a free quote. The Sony Vaio Flip SVF13N17PXS comes standard with 8GB of integrated memory. It does not have any memory slots so it can not be upgraded.